Curry Goat Roti | Don the Apron! I was lucky enough to eat a couple of these during my trip to Trinidad this summer. Usually served in a roadside “roti shop”, you can choose from a variety of meats including chicken, duck, goat and beef, which they wrap up in your choice of roti, usually dhal puri (essentially a roti filled with crushed yellow split peas) or buss up shot. 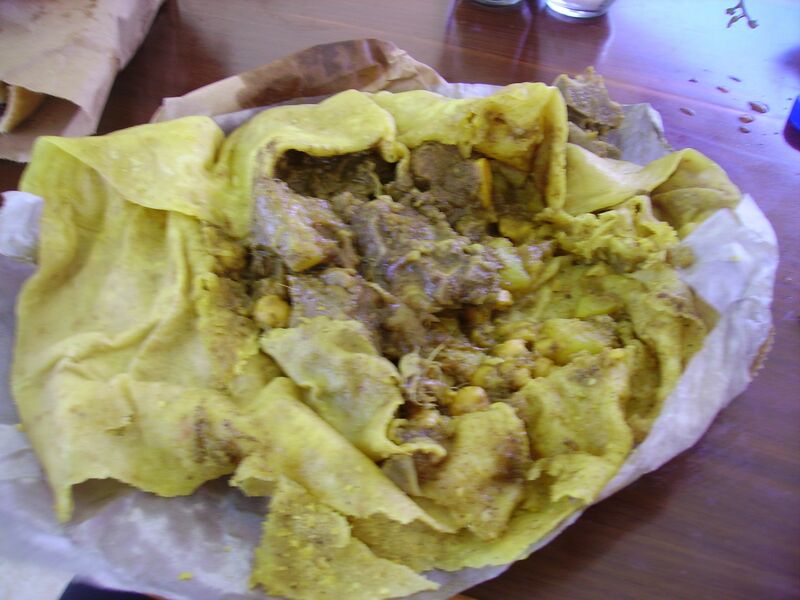 The curry goat roti featured here is made up of dhalpuri, curry goat, curry garbanzo beans and potatoes, and lots of hot pepper (because that’s how I like it!) You will be sure to make a mess of yourself after eating one, but who doesn’t enjoy that? This entry was posted in Eating Out, Goat, Trinidad by Coralie. Bookmark the permalink.